7am: Wakeup I woke up this morning (sans alarm–yes, I’m one of those annoying morning people) feeling….strangely GREAT. I went to bed hungry so I was curious (and yes, a bit apprehensive) as to what this new day would bring, but I’m feeling GOOD! Took a long walk with the dog this morning and had some hot water with lemon before my morning smoothie. 9am: Raw Smoothie Same as yesterday’s. Love it, very hearty. I wasn’t even hungry for breakfast, strangely enough. Let’s re-assess in a few hours before lunch. 10:45am: I am starting to feel a little..well, woozy. I haven’t moved from the sofa since breakfast (catching up on Project Runway) so it’s not like I’ve been active. I think I’m just hungry. Going to snack on some carrot sticks to tide me over till lunch. 12pm: Root Ginger Soup carrots, lentiles, ginger, herbs, potassium broth, salt, garlic, parsley, collard, flax OMG this soup was amazing! Creamy, thick, tasty, warm. JUST what I needed. I added some brown rice and 1/4 avocado to the soup (OK per my personalized modifications) and after eating I am completely satisfied. 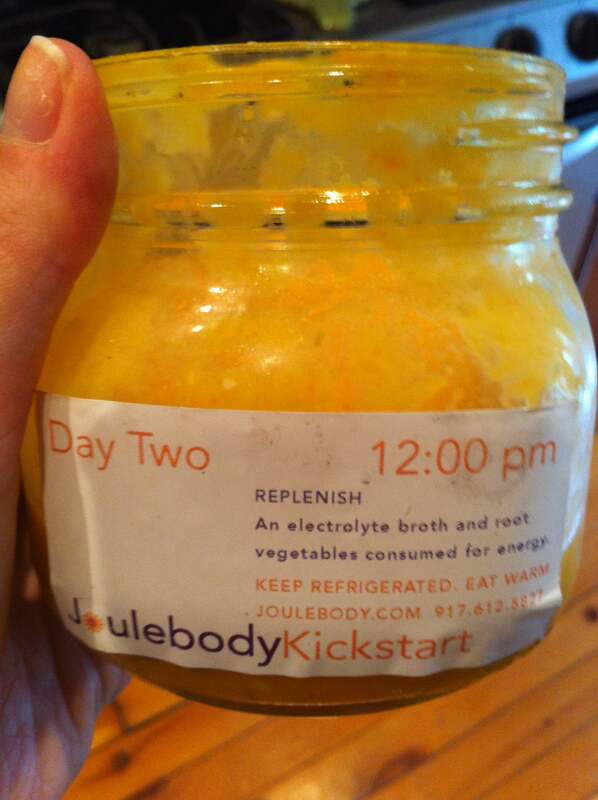 Another reason why I think this lunch was so satisfying is because I know that Yvette, the founder of Joulebody, made this herself, in her kitchen. It doesn’t come from a big facility and I can actually taste that this cleanse was made specifically for me. Makes me feel special. I also noticed that I haven’t had any cravings yet. I figured I’d be yearning for chocolate or something sweet but in all honesty, I haven’t. I’m very sensitive to when there’s no sugar in my diet but yet I haven’t felt those intense cravings. Score! 3pm: Green Joule Drink Same as yesterday, just as good! Very refreshing, and love the chia seeds to give it some texture. 3:45pm: I went for a 90 minute walk with my dog and for me, that’s about all I could muster for exercise today. Even though I’m feeling good and clear headed, I’m still a bit tired and I don’t want to push myself. I’m hoping tmw I will make it to chisel class. I’ve been snacking on some carrots to tide me over because I’m slightly hungry. This cleanse is also answering the question: When food isn’t part of your day, how do you fill your time? I’m so accustomed to always cooking, preparing, and thinking of where and what I’m going to eat. If I’m sad, bored, tired, etc., my first reaction is to turn to food. Now, during this detox, I don’t have that option. It’s quite eye opening for me to see how much I turn to food in my life. 5pm: Citrus Cleanser Same “master cleanse” as yesterday. Love the spicy aftertaste kick. I am definitely more hungry today, perhaps from the long walk I took. I was getting a manicure just before drinking this juice and I was grumpy and cranky and had NO patience for the manicurist who was too slow. I quickly walked home to be in the comfort of my own home. Cannot wait for dinner! I was amazed that I was satisfied by a small portion of food. This makes me realize that I’m normally eating too much! 8pm: Fiber Cookies Same as yesterday, a welcome sweetness to the day. I enjoyed them after my massage. Recap: Today was WAY better than yesterday. My energy and mental clarity increased. I did experience some moments of crankiness, but nothing like yesterday. I still do not have any cravings for sweets. I experienced more hunger pains, but was satisfied with the juices and the meals. The carrots, brown rice, and avocado really helped me get through the day. What’s becoming clear: I’m beginning to understand why this is called the Kickstart…it’s like pushing the reset button on your diet. I’m hyper aware of what I put into my body and how I feel afterwards. 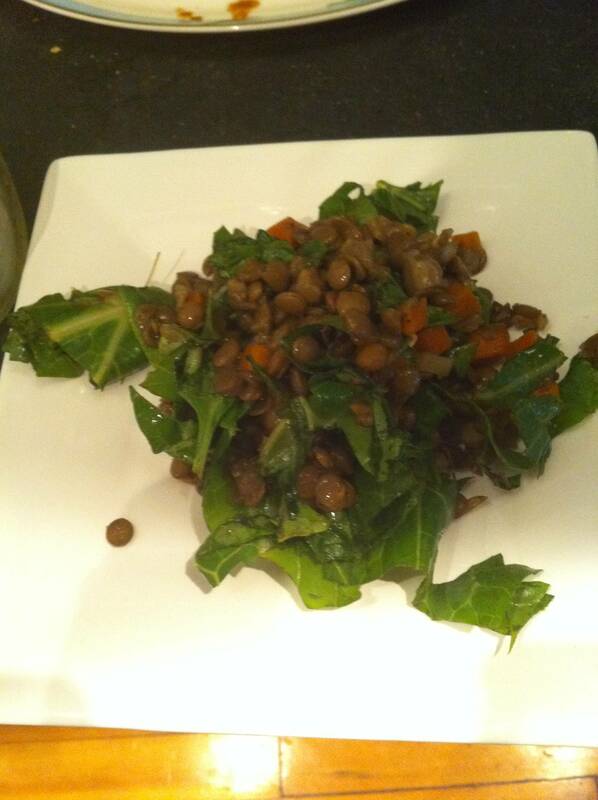 Eating fresh, unprocessed, wholesome foods just makes me feel good (ie. no bloating, etc). I’m realizing that I can be satisfied with less food on my plate. And, I’m re-familiarizing myself with the sensation of being hungry. Somewhere along the way I started believing that hunger was something bad, a sensation to fear. I realized today that I haven’t been truly hungry in a while, and I love feeling how my body is checking in with me, telling me what it wants. Day 2 done….one more day to go! Entry filed under: nutrition. Tags: cleanse, detox, diet, Joulebody, Kickstart. It is such an amazing privaledge to watch someone that isn’t my family or friend experience my program. I am unbelievibly lucky to see this unfold. Being unattached to the outcome and using this as a tool to enhance my product. Thank you for taking notice that the food is seems to be made by me…although it’s executed by a professional chef, I put lot’s of work into formulating the recipes.